Lady Montfort has been planning her annual summer costume ball for months, and with scrupulous care. Pulling together the food, flowers and a thousand other details for one of the most significant social occasions of the year is her happily accepted responsibility. But when her husband's degenerate nephew is found murdered, it's more than the ball that is ruined. In fact, Lady Montfort fears that the official police enquiry, driven by petty snobbery and class prejudice, is pointing towards her son as a potential suspect. Taking matters into her own hands, the rather over-imaginative countess enlists the help of her pragmatic housekeeper, Mrs. Jackson, to investigate the case, track down the women that vanished the night of the murder, and clear her son's name. As the two women search for a runaway housemaid and a headstrong young woman, they unearth the hidden lives of Lady Montfort's close friends, servants and family and discover the identity of a murderer hiding in plain sight. Tessa Arlen, the daughter of a British diplomat had lived in, or visited her parents in: Singapore, Berlin, The Persian Gulf, Beijing, Delhi and Warsaw by the time she was sixteen. She came to the U.S. in 1980 and worked as an H.R. recruiter for the Los Angeles Olympic Organizing Committee for the 1984 Olympic Games, where she interviewed her future husband in 1983 for a job. 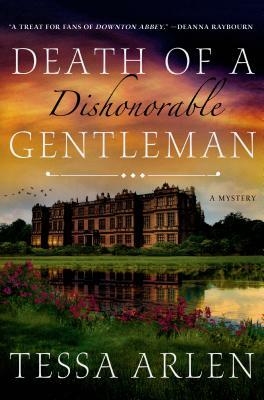 Death of a Dishonorable Gentleman is Tessa’s first novel. She lives in Washington.